Let me know if you run into him in the forest! His gaming schedule is sporadic, and less frequent these days as I am unemployed and have a lot of time to spend hanging out with him. Occasionally we may play together, but I would rather watch him playing than play with him as a deer. Don't expect him to perform too many actions--although he seems to understand the joystick layout better than I do. So far I've noticed him listening, roaring, dancing, jumping (lots of this), and laying down. And please take some screenshots, because I doubt he will. Read More to learn about the parrot who shares the forest with you! In light of current events, I felt this video was necessary. If you have no idea why this is funny to me, try reading up on Internet culture. On the Internet, nobody knows you're a parrot! Can animals play video games? Researchers at MIT have been creating computer software for parrots for a long time. 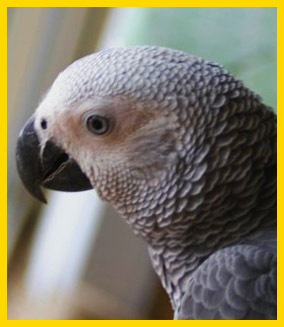 Their African greys enjoy viewing videos and listening to music on their "InterPet Explorer" program, and even have a specialized interface for accessing different sites. 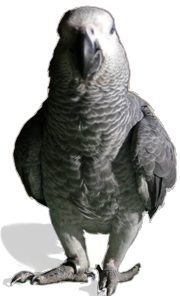 Well, I've got an African grey as well (see Fig. 1), and he's a smart little bugger. He spends more time on his own than I'd like, and it's hard to keep up with his appetite for destroying his toys. So I'm giving him my old computer. Rather: I'm hooking up my old computer to the big screen in the family room, and letting him control a joystick to see if he enjoys it. I know he loves moving pictures: he adores watching movies or video games, and often talks to the images he sees, or even goes up to the screen to try to touch them. At first I was just planning on giving him access to simple flash games, things like this or this. Then I thought, "What about The Endless Forest? It has joystick controls ..."
I've never used the joystick controls, though. Mine is a two-button, the simplest I could find (I mostly expect him to press the main button, not the trigger). Can I set those two buttons to do actions? Dance and Roar, perhaps? What do you guys think of this idea? Is it crazy? Would you like playing TEF with a parrot? Arranged in order of most recent. Cricket is going to tell you a story tonight, so gather around the camp fire. This is a true story that many of our newer players may not know. It is called The Silence of the Fawns. A raven of unusual size wanders the Forest. Not only is it uncommonly large, but for some unknown reason, the Twin Gods have named it. It appears to be called ... .
shows little fear of deer. It will readily land in the middle of a large herd of deer with seemingly no concern of being trampled. When roared at, it simply caws in response. If a stag attempts to step on it or kick it, it simply flutters out of reach, sometimes even returning a few minutes later. It has even been seen shuffling and hopping about alongside groups of dancing deer. seems to gravitate toward fawns, possibly because they are smaller in size, but its motives are indiscernible. Though it often appears to be trying to communicate with the deer of the Forest, its gestures and body language are still a mystery, for most of them look alike from a deer's perspective. , or Zodiac, is an ancient elk who has only recently chosen to receive a name from the Twin Gods. He spent his youth hidden in the Forest's darkest corners, afraid not of other deer but of the mysterious happenings that sometimes occur when the Twin Gods are about. In his old age, he has finally learned to enjoy rather than fear the strange magic that the Twin Gods work, and has decided to revere them and accept the name they have given him. rarely runs. He is patient, and takes his time in traveling from place to place in the Forest. He enjoys slow walks with others, and sitting near the Old Oak and on the bridge, listening to the music of the water and the trees. He tolerates and is sometimes amused by the antics of fawns, but does not join them in their games. He has a special fondness for nameless deer, having been one himself for so long. is distinguished from other deer by his shaggy chest and large, blue antlers. He usually wears the peacock mask, for he likes the way it matches his antlers and finds that it shades his eyes from the sun very well. (Click for full size) , or Cricket, is an eccentric deer who is usually found in mushroom circles. She prefers prancing to walking, and when she walks it is often backwards. She loves spells, and will go out of her way to cast them and receive them. For this reason, she rarely maintains any consistent appearance. However, her favorite mask is the Forest Spirit mask, and she will often choose to remain a mini-deer for as long as possible, because it puts her eye-to-eye with fawns, bluebells, and butterflies. , for all her frivolity, has a tendency to be oblivious to the aggression of other deer. She delights in doing things that make other deer tilt their heads in confusion, such as moonwalking and tree-sitting. Though she loves a good play fight, she has yet to find a reason to be angry at any other deer. is quite friendly, but she is also fairly unpredictable, and may wander away from a conversation or a dance without warning to go lie in the sun.